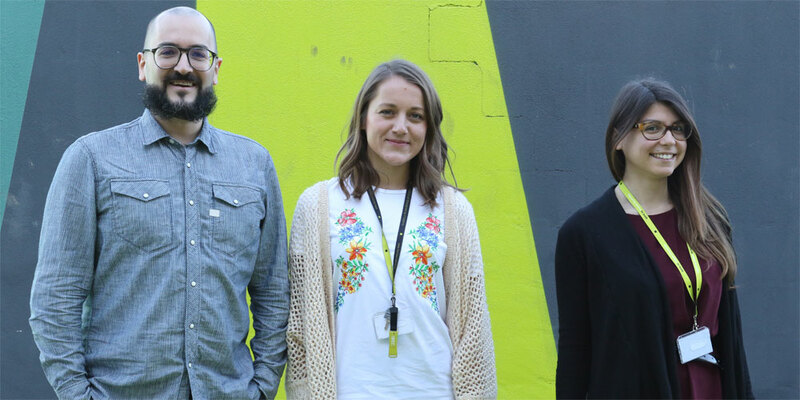 In the group we advance cross-disciplinary research at the interface between biology, physics and engineering by studying the mechanical biology and the biological mechanics of pathological development and disease progression. Specifically, we focus on soft tissue morphogenesis – the process by which a tissue takes or lose shape. 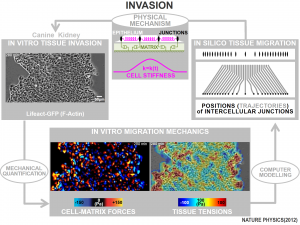 Deciphering the physical mechanisms of tissue morphogenesis is a powerful expedient to identify new mechanical hallmarks of cancer progression and define principles of tissue design for organ regeneration. This is so because both healthy and pathological tissues take or lose their shape through processes such as folding, segregation, growth, remodelling and invasion. These are biological processes involving mechanical events that require cells to deform, bear or develop forces as well as to fine-tune their material properties. Deciphering these processes in normal and pathological conditions provides experimental data that can be directly translated into therapeutics targeting diseased cells and tissues at the physical level. 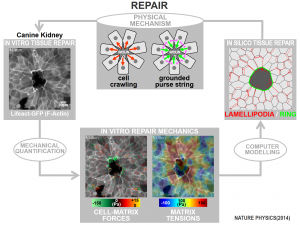 To that end, we are developing new multidisciplinary methods to quantify cell and tissue mechanics in arbitrary 2D and 3D environments that have physiologically-relevant properties. These methods hybridise physical, computational and biological approaches to extract mechanical information from large amounts of experimental data in vitro, in vivo and ex vivo. This data is utilised to identify what mechanical quantities can determine and/or predict cells and tissues dynamics in normal and pathological conditions such as those of carcinogenesis and tumour progression. Vito Conte may be familiar to many, having spent more than four years in Xavier Trepat’s Integrative Cell and Tissue Dynamics group, first as a postdoc and later as a Juan de la Cierva fellow. Vito now is a Ramon y Cajal fellow and leads the Mechanics of Development and Disease group, which will take a new direction as he develops new biophysical tools to quantify the mechanics of cell and tissues in 3D environments. Abstract We present a least-squares based inverse analysis of visco-elastic biological tissues. The proposed method computes the set of contractile forces (dipoles) at the cell boundaries that induce the observed and quantified deformations. We show that the computation of these forces requires the regularisation of the problem functional for some load configurations that we study here. The functional measures the error of the dynamic problem being discretised in time with a second-order implicit time-stepping and in space with standard finite elements. We analyse the uniqueness of the inverse problem and estimate the regularisation parameter by means of a L-curved criterion. We apply the methodology to a simple toy problem and to an in vivo set of morphogenetic deformations of the Drosophila embryo. 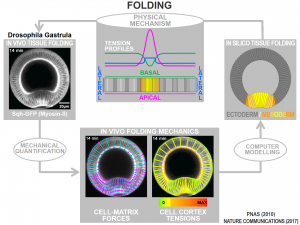 Embryo-scale morphogenesis arises from patterned mechanical forces. During Drosophila gastrulation, actomyosin contractility drives apical constriction in ventral cells, leading to furrow formation and mesoderm invagination. It remains unclear whether and how mechanical properties of the ectoderm influence this process. Here, we show that Neuralized (Neur), an E3 ubiquitin ligase active in the mesoderm, regulates collective apical constriction and furrow formation. Conversely, the Bearded (Brd) proteins antagonize maternal Neur and lower medial–apical contractility in the ectoderm: in Brd-mutant embryos, the ventral furrow invaginates properly but rapidly unfolds as medial MyoII levels increase in the ectoderm. Increasing contractility in the ectoderm via activated Rho similarly triggers furrow unfolding whereas decreasing contractility restores furrow invagination in Brd-mutant embryos. Thus, the inhibition of Neur by Brd in the ectoderm differentiates the mechanics of the ectoderm from that of the mesoderm and patterns the activity of MyoII along the dorsal–ventral axis.